This rather difficult route can be used to link the two branches of the Dosewallips River trail for a long loop; total distance is 32 miles: 26 miles on trail and 6 miles cross-country. 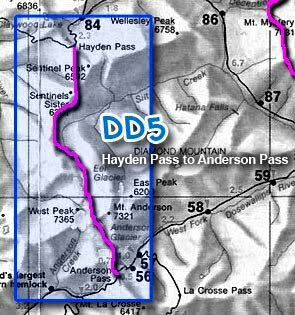 Because Hayden Pass can also be reached by the Elwha River trail and Anderson Pass can also be reached by the Quinault River trail, other long traverses can be created using this route. See the published Climbers Guide for detailed approach information. Because this 6-mile traverse involves the ascent and descent of two glaciers, it should only be attempted b experienced mountaineers equipped for crevasse rescue. It is hikable throughout the climbing season, but there is a significant increase in difficulty during the latter half of the season after the snow melts off. Though the 6-mile distance can be done in one day, most parties prefer to establish camp on the moraine near the base of the Eel Glacier. From Hayden Pass, go S around Sentinel Peak on the W side of the ridge. Contour southerly, bypassing Sentinel's Sister (formerly Peak 6301) to the E. Continue S on game trails and meadows. Stay as high as possible to avoid the worst of the slide-alder fields and avalanche debris. Dropping too low means a long day of brushwhacking and eventually having to climb back up steep hills in order to get past a cliff that stretches across Silt Creek canyon. After traversing about 1.5 miles, begin dropping towards Silt Creek. This is made easier by occasional large alpine meadows on gentle slopes. Eventually this path leads toward a hump in the landscape. Attaining this hump gives one the first full view of the moraine below Eel Glacier. Due to glacial shrinking in the last decade, it is nearly a mile to the tongue of the glacier from this point. Eel Glacier is moderate but presents hazards with marginal crevasses up to 10 ft. across, encroaching one-third of the way in from either side of the glacier. Climb to the obvious notch (Flypaper Pass) at the head of the glacier W of the summit of Mt. Anderson. A very steep chute descends S to the moderate Anderson Glacier from the pass. Descend Anderson Glacier, which now reaches less than halfway to the terminal lake, and climb the moraine to the E of the lake. Heading SE, the route soon arrives at a small pond and several campsites in the meadows. A good way trail leads from the meadow to Anderson Pass. Note: A direct route to the Quinault drainage from the Anderson Glacier should not be attempted, as it leads to severe cliffs.